The general assumption is that tomorrow's Google announcement will not only feature the new Nexus 7, but that it will also show off Android 4.3. 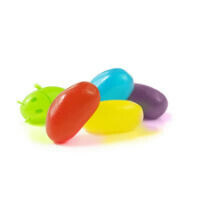 Android 4.3 is expected to be another incremental update to Jelly Bean, and we're getting to see some of the improvements detailed in a new video. The good folks over at pocketnow have loaded up a leaked ROM of 4.3 and gone through the various changes that they found. The biggest improvement that we saw is the battery life performance. There had been a fake rumor a while back that Google was working on something called Project Roadrunner, which would do for battery life what Project Butter did for performance. The rumor turned out to be fake, but that didn't mean Google wasn't working on the fix anyway. According to pocketnow, battery life in an informal test went from about 4-6 hours of heavy usage to over 25 hours. A big part of the boost from the battery meter seems to be in much much better standby battery life. In addition, the Android dialer now has autocomplete for both phone numbers and names. This is a feature that has been in custom software from various manufacturers, but it is new for stock Android. There is a new Emoji keyboard with what looks like hundreds, if not thousands of emoji. The only issue is that it is unclear if the emoji are visible on any device, just Android, or just Android with the updated keyboard (since that has been decoupled from stock). Other than that are the smaller updates that we expected, like Bluetooth 4.0 LE, the new camera app interface, and increased performance. Overall, it's definitely not an insubstantial update, especially if the battery life claims turn out to be true, but it is certainly an incremental update since the new list of features is a bit light. It's mostly performance tweaks. What a lie. 4-6 hours of heavy usage to over 25? With the same battery capacity? Heavy usage? What kind of trash lies are they spouting? Oh, most of the improvements come from better standby it seems. So it's not under heavy usage. In other words, not much difference. Exactly. The big dips were at the beginning and end of the day and in the middle valley was during work time. So overall, I'd say this is normal usage for most people. 25 hours is amazing. I'm pretty impressed when not just battery efficiency is improved but also performance as well. the thing was snappy and the benchmarks showed the improvements. Stock N4's get around 14000-14500 on antutu and this pumped it up by 2000 which is a big jump for only software changes. Just for a simple software update to a phone, I would be extremely impressed by just 2-3 hours extra of battery life. I think he means his smartwatch, not the phone itself. All I care about is a fix for the numerous bugs in 4.2 to 4.2.2. The rest is all icing on the cake. A fix for the HDMI :3! I find that very hard to believe, but if Google somehow managed to pull this off and demonstrates this tomorrow, I'll gladly reconsider. Emoji is on Android 4.2.2 and that's nothing new. If that amount of battery optimization holds true for more devices than just the Nexus 4, then Droid MAXX is going to sell like crazy, and the Notes 2 and 3 will hold a charge for days! Looking forward to this on my Note 2. Yeah, especially since Sammy is going straight to 4.3 and bypassing 4.2.2. Hopefully they throw in a fix for the surfaceflinger problems with the nexus 10, and any word on reduced RAM usage? Honestly if you look at the battery info it looks like 6 hours of screen on time. Speaking of which he really shouldve just shown the on screen time instead. Rather unbelievable achievement. Hope it's true!! any improvement in low-light performance?? or how about easier access to phone logs?? it takes three clicks to get there! !